Equine Dwarfism - equine-dwarfisms Website! Talking about "dwarves" has different meanings in common and technical use. Accordingly the emotional evaluation is different on both sides. 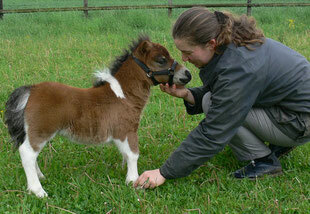 Firstly we have to clarify that in common use every healthy and small Miniature Horse/Pony is called as a "dwarf". That means everyone of us saying "a dwarf" simply talks about a small Miniature - a dwarf in comparison to a normal full sized horse. At first sight there is nothing worse about it. However this small Miniature called a dwarf belongs to a special breed. So you can differ it correctly for e. g. as American Miniature Horse, Falabella, Miniature Shetland Pony, Britidh Spotted Pony, Belgian Shetland, German Partbred Shetland and so on. Now you know one side about calling something a "dwarf". The other side is now technical and scientific. Breeders and researchers are talking about dwarves when a Miniature is affected by a genetic disease. This means the specific animal suffers on several different skeletal anomalies. Many variations exist. Now in 2016 already 7 mutations are discovered and can be tested. In 2013 Dr John Ebert discovered 4 mutations causing chondroplasia like dwarfism in Miniature Horses and Shetland. One year later a researcher team at University Utrecht leading by Willem Back discovered the mutation causing Friesian dwarfism. And now in 2016 a swedish team has identified two mutations causing skeletal atavism in Shetlands and Miniature Horses. As you can realize now there are two sides on the medal when you are talking about dwarves. If you want to buy a Miniature so do not ask for a dwarf... ask for the specific breed. Of course you can also buy a dwarf. But you now know the difference. This Website is dedicated to the genetic disease called "equine dwarfism", all living dwarves leading a hard life, all breeders which had opened their eyes and donated DNA to make genetic testing possible and in beloved remembrance to all dwarves which had to walk over the rainbow bridge. I hope that all these collected information will sensibilizise private horse friends and breeders to this topic. Don't close your eyes any longer. You are breeding great animals - now make them healthy...aren't they worth it? Please do not judge others. If we are deeply honest to ourselves we all love small little sweet things. 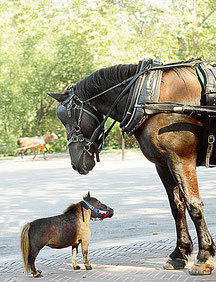 Dwarfism is also seen in humans, cattle, dogs, donkeys and many more species. Special thanks to Liz. C/Threnody works for the beautiful grafics and remarkable english text work. You can find her complete project in myhorseforum.com. All sources are mentioned directly to the text. If you want to make contributes do not hesitate to contact me. Pics and stories about dwarves are always welcome.